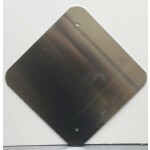 Standard Traffic Sign Blanks are .080 gauge 5052-H38 Aluminum. All standard blanks come with a standard radius and hole punching. Best Quality Every Time. Custom sizes, punching and radius options are available. Aluminum, polymetal, corogated plastic, and sintra are just some of the material available for custom blanks. If you don't see the sign blank you are looking for please email or give us a call.